As an exercise for Coursera Data Science Specialization I’m presently taking, I had to develop a Shiny app with the aim to visualize data. For this, I wanted to look at milk prices, farm gate and retail, in Canada and for various countries. The Shiny app can be found at https://dhaine.shinyapps.io/milkPrice/. I collected data from Canada, U.S.A., New Zealand, and the EU (EU 15: Belgium, France, Spain, Ireland, Portugal, Germany, Luxembourg, United Kingdom, the Netherlands, Denmark, Austria, Sweden, Italy, Finland, and Greece; EU 28: the aforementioned countries plus the Czech Republic, Estonia, Cyprus, Latvia, Lithuania, Hungary, Malta, Poland, Slovenia, Slovakia, Bulgaria, Romania, and Croatia). Obviously, some data are missing for either countries or years. All prices are given in Canadian dollars, using currency conversion on first day of the year (obtained from XE Corporation). U.S. data on farm gate prices are from USDA-NASS and were converted from cwt to litre (1 cwt = 44.0242 litres). Canadian data are from Les Producteurs de lait du Québec. New Zealand data are from CLAL.it. European data are from DG Agri. Kilograms of milk were converted to litres (1 kg = 0.9708737864 litre). Data on retail prices for Canada are coming from Statistics Canada, for the U.S. from USDA AMS, and for Europe from Eurostat (available only on a yearly basis from 2013 to 2015). U.S. prices were converted as price per litres from the reported price for half a gallon of milk (half a gallon is 1.89270589 litre). Canadian and European prices are for semi-skimmed milk. So here are the farm gate prices for Canada, EU15, New Zealand, and USA. And here’s a comparison of retail prices from Canada and a few other countries. We see that both farm gate and retail prices are very stable in Canada, contrary to other countries, especially the US. Farm gate prices are also higher in Canada than the US, EU, and New Zealand. Canada has a national supply management system, put in place in the ‘70s to stabilize prices that were quite volatile before that. This system set the price of milk according to the cost of producing it, controls the milk supply to the market, and limits the importation of milk and milk products. Export of milk is also limited. So farm gate prices are higher in Canada than the US. But let’s not forget that US dairy production system is subsidized (22.2 billion USD in 2015 or 0.35 CAD per litre, i.e. 73% of the producer’s returns - realagriculture) while the supply management system do not provide such subsidies to the Canadian dairy producer. 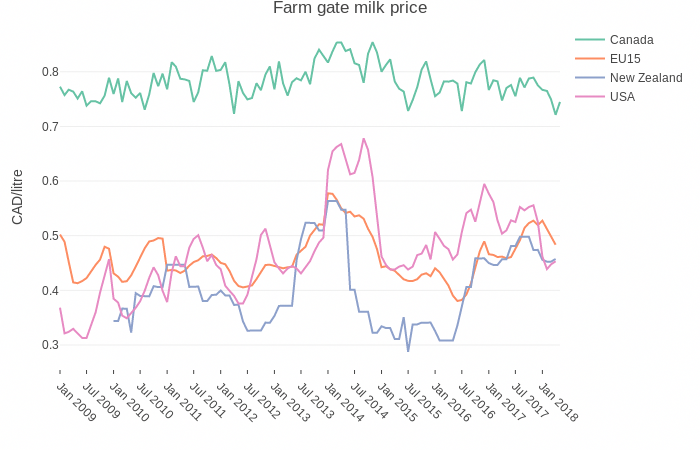 Moreover, it is not easy to compare prices across countries (farm gate or retail). Production systems are different, production and economic records are not standardized, and the product itself is different. For example, rBST is allowed in the US but not in Canada, New Zealand or the EU, norms and regulations varies, etc. Regarding the retail prices, things are not easy to compare. First I couldn’t find New Zealand prices, and the EU prices for some countries and/or periods only. Even units can be different. US data are given for a gallon, or half a gallon, while it is per litre in the other countries. And as always, buying in larger quantities is cheaper than smaller ones, i.e. US prices here are certainly slightly underestimated. Therefore we see that retail prices are marginally higher in Canada than the US, while it can vary greatly between European countries. Are these graphs trustworthy? Well, the objective was to design a Shiny app, so the focus was on programming it, not especially finding the most accurate data. And as I learned, there are big differences between countries. 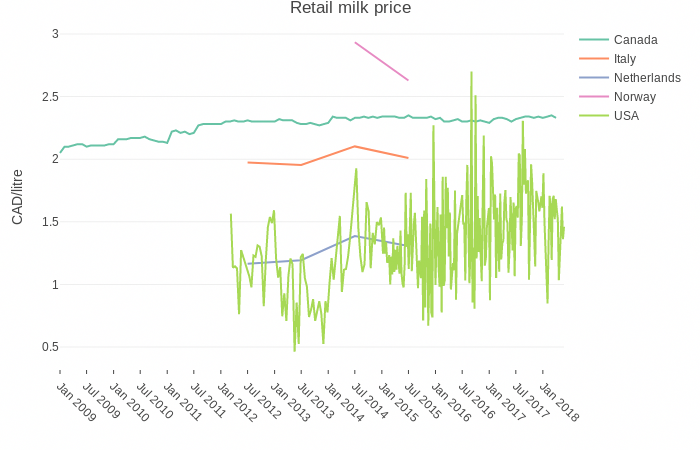 The app allows to choose between different milk prices and to compare between various countries. Plots can be saved, zoomed in, hover it etc. Shiny apps are really awesome (I’ve got another for the use of my R package episensr) and, finally, finding data was more difficult than building the app!